Chiang Mai Itinerary - Activities No One Should Miss in Thailands North! Chiang Mai, the second biggest city in Thailand, is an attractive destination for every Thailand itinerary and has things to do to suit every travellers taste. No matter whether you like food, culture, religion, nature or just having fun in the sun, you can find something for everyone on a Chiang Mai itinerary. We stayed in this wonderful city for 2 months and so we had plenty of time to find all the best things to do in Chiang Mai. Whether you stay only one day in Chiang Mai or for several weeks, we’re sure that you will find something interesting to do on this list. To make it easier for you to plan your Chiang Mai itinerary, we added the time needed for each activity. We had an amazing time during our visit, and we hope you’ll enjoy your Chiang Mai adventure as much as we did. Doi Suthep is the name of the mountain and national park where you can find the stunning Wat Phra That temple. However many people will use the name Doi Suthep for the temple, which itself is one of the top Chiang Mai attractions. Not only is it a beautiful temple, but also you have an amazing view over Chiang Mai from where it stands. Built in 1383, this monastery is still active and used by monks today. It is the most sacred temple in Chiang Mai and every child in Thailand learns the legend of its origin at school. The legend says that the king of Lanna mounted a piece of a bone from Buddha’s shoulder on a white elephant and released this elephant into the jungle. The elephant then climbed up the Doi Suthep. When he reached a certain point, he trumpeted three times and died peacefully on the spot. The king of Lanna saw this as a sign and ordered to build the Wat Phra That temple at the place the elephant passed away. To reach the actual temple you’ll have to take 306 steps or pay for the funicular. At the time we visited this temple the entrance fee was 30 Baht. In case you forget to bring something to cover up, you can rent a Sarong for a small fee. To get to this amazing place you can either hike up the hill or take a taxi (Songthaew, TukTuk, Grab). A Songthaew should cost you about 40 Thb, but they normally wait until they have enough passengers before they depart. You also have the option to charter a Songthaew for about 300 THB for one way or 500 THB for both ways, including the time the driver waits for you while you visit the temple. This is especially a good deal when you are a bigger group of 6-10 people. 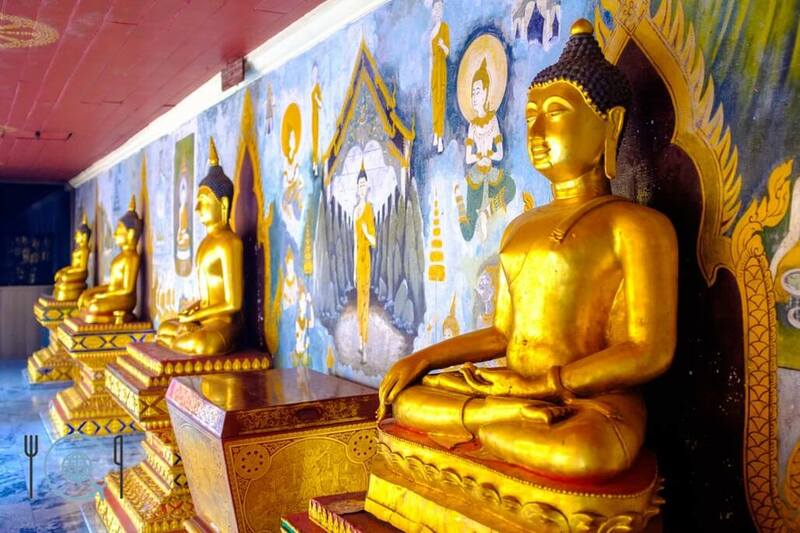 If you want to know more about this temple in Chiangmai, then head over to our fellow bloggers from Tripsavvy and read their guide about the Wat Phra That Doi Suthep. Our personal highlight was definitely the magnificent rainbow over Chiang Mai, which appeared just as we got to the viewpoint. A view we’ll definitely not forget anytime soon! Taking a Chiang Mai temple tour is one of the best ways to experience the deep spirituality of Thailands northern capital. Chiang Mai is said to have more than 300 temples and in the Old City alone, there are more than 30. Many of them are open for you to go inside and explore. Wat Phra Singh and Wat Chedi Luang are two of the oldest and grandest temples in the old city. We won’t list them all here, but suffice to say if you like temples, you will love Chiang Mai. Have a look at this post if you wonder why there are so many temples in Thailand. Please note that Buddhist temples are holy buildings and so visitors are required to demonstrate cultural respect. This means you must dress appropriately, covering your shoulders, midriff and legs to below the knee. This applies to everyone. Visitors must also take off shoes at the entrance, and it is considered rude to point your feet at the Buddha statue or turn your back to it. Many of these temples are used for local prayers at the same time as they are being visited by tourists, so it is only polite to respect the rules that the temples put in place. And let’s face it – nobody wants to be put into the same category as these guys. All the temples around the city give Chiang Mai a very magical atmosphere. If you are the slightest bit interested in the religion and culture of Chiang Mai and Thailand in general, then the following activity is perfect for your Chiangmai trip: Have a chat with a monk. These Monk Chats are one of the most impressive things to do in Chiang Mai Thailand. Even if you only have about 15 minutes time, you should not miss this opportunity! You sit on a table with some young monks and talk about whatever you’d like to talk. This is a perfect chance for the young monks to practice their English and for you to find out more about their life as a monk, and ask any questions you may have about life and culture in Thailand. Got the Spiderman urge to climb up waterfalls? Then this is exactly the right activity for you! The Bua Thong waterfalls northwards of Chiang Mai are some of the most unique things we’ve seen on our stay in Chiang Mai and a perfect destination for a Chiang Mai half day tour. The waterfalls are made of limestone and mineral deposits. Because of this, the surface is rough and creates enough friction for being able to climb it easily without slipping. There are several tiers of the waterfall and all of them are climb-able. Most people walk down a path to the bottom of the waterfall and then climb up again. We also climbed down which felt a bit like starring in the movie Cliffhanger. There are several ropes installed which will help you to safely reach the top or bottom of the Sticky Waterfalls. We visited the Bua Thong Sticky Waterfalls on a very hot day and the cool water was the perfect antidote against the heat! There were actually not even that many people there as it is one of the lesser known Chiang Mai tourist attractions. To get to the Bua Thong Waterfalls you have to drive about 90 minutes northwards from Chiang Mai. You can either do this with your own vehicle or rent a Songthaew. A Songthaew should cost you not more than 1000 THB, including getting you there, waiting for you while exploring the waterfalls and then bringing you back again. If you can find a bunch of people to share with, you can split the cost which makes it cheaper. Ecotourism had a huge boom in Chiang Mai and especially the Elephant parks are becoming more animal-friendly than ever before and a great attraction for any Chiang Mai tours. There are now more parks that advertise themselves as being no-riding of the elephants allowed, than those which still allow riding. This is really great because elephants are not meant to be ridden – it puts their spine under stress and causes injuries. There are still negative stories about some of the elephant parks, like how they chain the elephants or train them using hooks, both of which cause pain and injuries to the elephants. The area for the elephants in the Elephant Nature Park is huge! Why choose Elephant Nature Park Chiang Mai? The one elephant park that shines the brightest amongst all of the others in terms of taking care of the animals is definitely the Elephant Nature Park! No other park is as ethical as this one in the way that it treats the elephants in its care. Recently (April 2018) they even stopped offering customers the chance to bathe with the elephants. The reason behind this was, that the elephants cannot truly enjoy their bath in the same way as they would without people. A daily bath is an integral part of the elephants day, helping them to cool off from the heat, so allowing them the chance to do this peacefully without human intervention shows a great level of respect for the creatures. This kind of animal care makes Elephant Nature Park one of the top things to do in Chiang Mai! Isn’t this a happy face? The visit to this park was the highlight of our whole Chiang Mai travel itinerary! It was so amazing to see those beautiful animals up close and being able to feed and even touch them. It was such a great experience to see them roaming freely in this huge park within their own small friendship groups. Compared to the Tiger Kingdom, the cats in the Cat Kingdom in the Elephant Nature park can roam freely around. There are not only more than 70 elephants in this park, but also about 200 cats, over 400 dogs, horses, water-buffaloes and other animals who were saved. You can not only see but also feel how much the people who work there love the animals. We can recommend a Chiang Mai elephant tour at the Elephant Nature Park with a good conscience. The youngest kittens are held separately to protect them until they get bigger. This is probably the most unique attraction on our Chiang Mai sightseeing list. The Elephant Poopoopaper Park in Chiang Mai is all about making paper out of elephant poop. For a small fee of 100 THB, you get an entrance ticket including a guided tour. The tour is very informative and you learn how to make paper out of elephant poop (and other fibres) and why this paper is better for the environment than paper made from tree fibres. Elephant poop is actually mostly fibre as elephants are herbivores, so it makes the perfect material for making paper! We proudly present you our self made poo paper. The best thing about the whole experience is that you can make Elephant Poopoopaper yourself. The guide explains the process – the poop is cleaned by boiling it in water for hours, then it is put into a blender and dyed. After this, it is spread out onto flat palettes and dried in the sun. Once you know the process, you are allowed to dunk your own hands into the cleaned elephant dung and make your own paper. This might sound dirty, but honestly, it doesn’t even stink a little bit. Gaggi is the Swiss-german word for poo. In the area, they have also a cute little cafe where you get delicious coffee and snacks like “Elephant Poo Cookies” (not made from poo). The people who work in the Elephant Poopoopaper Park are very friendly and you never feel forced to buy something at the gift shop. This is definitely a great activity, especially for families with kids! Thailand is well known for its massages, especially the famous traditional Thai massage. During a traditional Thai massage you feel like someone is trying to take you apart, but afterwards, you feel newly born. Definitely an unforgettable experience. During our Thailand trip in Chiang Mai, we had an amazing spa session in the super-luxe Zira Spa! Their spa menu is very extensive and they offer great discounts on packages. You also made to feel like royalty from the moment you enter the spa until you say your goodbyes. Before the actual treatment starts, you get some fresh fruit and delicious juice. After that, your feet get cleaned in a warm flower bath. As my main treatment, I had the best herbal stamp massage ever in my life and my skin was super soft after the coffee and yoghurt scrub I received. Sarah felt completely relaxed after her traditional Thai massage and an aloe vera and mint scrub. Once the spa treatments were over, we returned to the lobby where there was already some tea and delicious coconut cakes waiting for us. If you want to feel relaxation like you never felt it before, then we can absolutely recommend you treat yourself to a visit to this wonderful spa in Chiang Mai. The delicious coconut cake we received in the end. If you’re tight for cash then a decent alternative is to get your massage fix in the Wat Phanwaen temple in the south of Chiang Mai Old Town. There you can get a Thai massage for 150 THB and an oil massage for 300 THB. It’s not anywhere near as luxurious as the Zira Spa and you don’t much privacy (as Thai massages require wearing clothing in any case), but the massages are absolutely fantastic and well worth the money! Located in the old walled city area of Chiang Mai, there is a Sunday Market taking place each week from 4 pm till 12 pm. This Walking Street market starts at the Tha Phae gate and occupies about 1km of the Ratchadamnoen Road. You can buy a lot of imitation design labels at the Night Bazaar in Chiang Mai. However, this Sunday walking market is more about the art and craftsmanship of the northern Thai people. A lot of the products you see on display are made by the vendors themselves and a lot more unique than the typical souvenirs you can find on the streets. How about some self made bowls? Or rather one of those cute elephants? If all the shopping makes you hungry, you can grab some food in one of the many restaurants or street food stalls you can find at the Sunday Market. We had some yummy Pad Thai and some delicious fresh fruit juices. If you love food and cooking, then visiting a cooking school in your northern Thailand itinerary is almost a must. There are a lot of great cooking schools in Chiang Mai and there is definitely also the right one for you amongst them. We really loved the Thai Akha Cooking School experience! Before we did the actual cooking we visited a typical Thai food market to buy our ingredients. We learned a lot and had the opportunity to try some of the fruit and veggies. After that we went to the actual cooking school and started to cook 11 (yes, eleven!) different dishes. Our cooking teacher at work. Why choose Thai Akha Cooking School? What we really loved about this cooking school was, that we didn’t only cook traditional Thai dishes. We also learned how to prepare three Akha (Thai mountain tribe) dishes. Our cooking teacher was very friendly and organised. From the 11 dishes you cook, you can even choose between four different choices for four of the dishes. Also, the dishes are not complicated and are relatively easy to cook again when you’re back home. Two of the delicious dishes we cooked. Click this link if you want to read more about our Thai Akha Cooking School experience in Chiang Mai. Or click here if you would like to book the cooking school. If you don’t like to cook, but you love to eat all the Thai food, then a local fresh market tour is the perfect activity for your Chiang Mai itinerary! Some of our favourite snacks (Pork Skin) are getting freshly prepared at the market. We discovered a Chiang Mai food tour where you will explore a typical Thai food market in Chiang Mai and eat as the locals do. If you’re open for new experiences then you can discover so much on this tour. Our guide told us so much about the Thai food culture and the single ingredients. If you want to try something, then you just have to tell her. She will acquire it for you and tell you interesting facts about the chosen ingredient or dish. This Chiang Mai activity is especially awesome when you do it at the beginning of your Chiang Mai stay, as it will give you a lot of confidence to just go to one of the markets and get your authentic Thai food there. Also, when else do you have the chance to try things like pork brain chilli or intestine soup? Don’t be scared, it is all super delicious and freshly cooked with the most fragrant ingredients. You can read our post about the Local Fresh Market Tour in Chiang Mai if you want to know more about it. If you’d like to do a market tour as well, you can book one here! Intestines for breakfast gives you power for the whole day. We absolutely LOVE cats and they love us. Because of that we absolutely had to visit the Catmosphere Cat Cafe in the north of the Nimman area. The cute cafe is home to many healthy cats and has a very chilled out atmosphere. The cats are always able to sit in areas away from the humans. However, most cats really seem to like the presence of people. The cats seem to enjoy the human company. When you enter the Cafe, you can see the names of the cats on several lists on the tables. Because of the decor and some of the cat names (like Luke, Leia or Yoda), you get the feeling that the owners of the cafe are big Star Wars fans. The entrance is 100 THB, but you get a free entry if you buy a drink or something to eat. The coffee we ordered was really good. If you love cats then you should absolutely visit this place while being in Chiang Mai! Our trip to Chiang Mai Thailand wouldn’t have been so perfect without it! This is not a complete guide of all the things to do during Northern Thailand holidays in Chiang Mai. But we think that these activities are definitely worth including in your Chiang Mai guide. If you’ve done something in Chiang Mai that you think belongs on this list, then leave a comment below! Check out this awesome tour as well if you plan to explore northern Thailand deeper! Also, our fellow blogger from The Globetrotter GP wrote a great post about a 10 day Thailand itinerary! Go and check it out. If you are planning to visit Bangkok, but would still like to learn a bit more about Northern Thai culture, then consider a trip to the Kamthieng House in Bangkok – read our article here. Do you feel inspired and want to go to Chiang Mai? Then check out Booking.com for the best Chiang Mai hotels and find out where to stay in Chiang Mai. If you want to read more about Thailand travel, then click this link. Disclosure: We were kindly invited to experience the services of the Thai Akha Cooking School and the Zira Spa in exchange for an honest review. All words and opinions are our own. I love this! So many cats:) The temples, talking to monks and elephants also look great. I love how you share how long each take.